Weekly Roundup: Youngest Bus Driver in Bay Area, Pets on Parade & MUNI Heritage – Peninsula Moves! Inspiring Young SamTrans Operator Highlighted in Feature Story: He gets up at 3 a.m. every morning to make the commute from Vallejo to South San Francisco, but that’s a small price to pay for SamTrans bus driver Theophilus Williams to live out his dream job. At just 19 years old, Williams is the youngest bus operator in the Bay Area, and possibly the state, according to an article in the Vallejo Times-Herald. In the story, which was posted on Friday, Williams said that he’s always dreamed of being a transit operator—in fact, before he was hired by SamTrans, he was already working as a transportation coordinator at the San Francisco International Airport. In the story, Williams is quoted as saying, ““God knew what I wanted to do with my life. He knew I wanted to be a transit operator.” Not only is Williams the youngest operator in the Bay Area, he’s also the youngest driver in the history of SamTrans. Williams works the 6 a.m. – 1:18 p.m. shift out of SamTrans’ North Base facility in South San Francisco. Pets on Parade in Burlingame: The favorite four-legged friends of Peninsula families will proudly strut their stuff in Burlingame on Saturday as part of the annual Burlingame Pet Parade. Founded in 2004 by a group of local residents, the pet parade was conceived as a way to bring the community together, and it’s still going strong in its 11th year, as evidenced by the 2,000 people who attended the 2014 event. The free gathering starts at 10 a.m. (pet owners who want to participate in the parade should check in by 9:30 a.m.), with the route winding through downtown Burlingame, mostly on Broadway Avenue. There will be plenty of prizes for parade participants, including awards for Best Dressed Pet, Most Unusual Pet and Best Pet Trick. Caltrain’s weekend schedule offers hourly service to the Broadway Station in Burlingame, which is just a block away from the parade route. 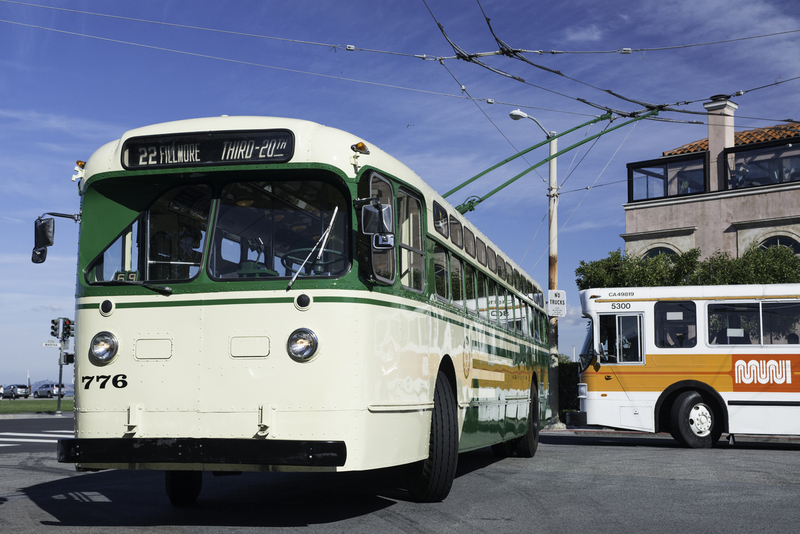 Muni Celebrates Heritage: Vintage buses displaying classic photos from San Francisco, free rides on historic streetcars and an appearance from a working cable car dating back to 1906 will all be part of Muni’s Heritage Weekend this Saturday and Sunday. Most of the festivities will take place near the Market Street Railway’s headquarters on 77 Steuart Street, with the schedule of events lasting from 10 a.m. – 5 p.m. The vintage buses will depart every 15 minutes from the offices of the Market Street Railway, which is a non-profit partner of Muni. The historic streetcars will also be offering “charter style” service between Pier 39 and the Ferry Building. Passengers travelling from the Peninsula can transfer at the San Francisco Caltrain Station to Muni’s newly-restored E-Embarcadero historic streetcar line for a ride to the event.